Coconut chutney is must have with any South Indian dishes like idi's , dosa, vada etc. This coconut chutney is an instant dip recipe which need only few ingredients. 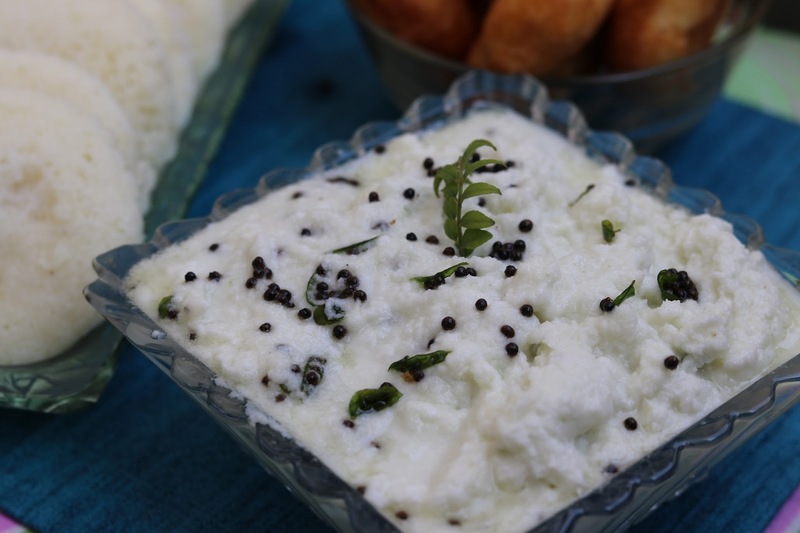 Get absolutely white coconut chutney made in restaurant style. 1. In a mixer grinder jar, add all ingredients except rai and curry leaves. 2. Grind to form nice white chutney. Keep it little on coarse side. If the chutney is too thick, add more milk or curd as required. 3. Prepare tempering by heating 1.5 tsp oil and add mustard seeds into it. As it slutters, remove from the flame and allow the oil to cool down. Once cooled, add curry leaves. 4. Add the prepare tempering on top of coconut chutney. Enjoy freshly prepared coconut chutney with idli, vasa, dosa or rice.